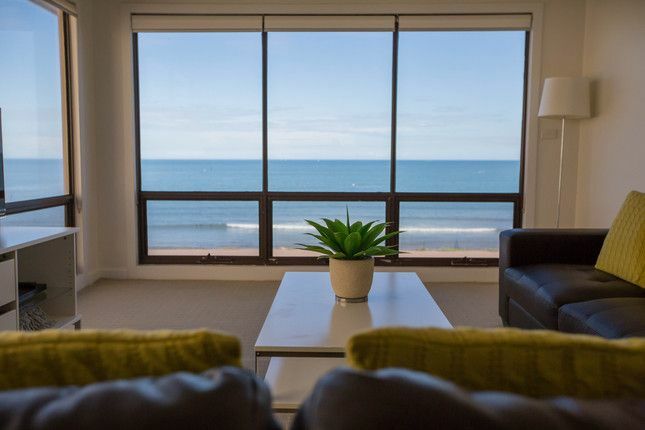 "Beachside at the Bay" is a 2 bedroom, 2 bathroom apartment situated on the beachfront at North Esplanade, Glenelg North. Wake up to the sights and sounds of one of Adelaide's most beautiful coastlines before you ponder the day ahead. The living area provides two 2.5 seater leather sofas to sit back and enjoy the stunning ocean views or relax and watch TV or a DVD on the 32" Plasma Television. The adjoining dining area seats 6 adults comfortably, alongside a Brand New fully equipped kitchen (including microwave & dishwasher). The main upstairs bedroom features a Queen Bed with built-in robes and boasts the same amazing views as the living area. The second downstairs bedroom consists of 2 single beds (1 with trundle). A separate laundry contains a front loading washing machine with ironing facilities. Off-street parking is available for one vehicle and ample on-street parking at no cost. SAFETY GATE for stairs provided if applicable. "Beachside at the Bay", Glenelg North is located 12 km from the Adelaide CBD and 5km from the Adelaide Domestic/International Airport. A short 15 minute walk will take you to Holdfast Shores Marina, the shops and restaurants of vibrant Jetty Road, the City tram and The BeachHouse amusement complex. * Strict "No Party Policy"
Only a few minutes walk away from the busy area of Glenelg. This place was in the perfect location for us, across the road from the beach. We saw dolphins directly in front of us several times during our stay. We were there during a heat wave in summer and the place was very comfortable with the aircon. We saw some amazing sunsets from the living area. We enjoyed this location. Across the road from the beach, 3 minutes by car from Glenelg but quiet enough to hear the waves at night. We recommend Beachside by the bay. Great views of the ocean out the lounge and main bedroom windows. Clean and tidy apartment. Location is wonderful with fantastic sunsets over the water. Kitchen could provide a few more essentials like oil and paper towel but the gas stove was good with great ventilation from the back door. Pity most of the windows didn’t open at the front for more fresh air. The stairs were a little rickety but overall a very pleasant apartment with off street parking. We were so looking forward to enjoying these beautiful views, unfortunately the upstairs bedroom had a roller blind however it was not a blockout blind, therefore the street light which was across the road made it very light in the room and you could see into the room from outside. You certainly couldn’t get undressed in the bedroom. The location was easy, close to airport and city with an amazing beach view from the living room and upstairs bedroom was amazing. The place was clean and spacious and very comfortable for four people. Will definitely think of this place again for our next Adelaide stay.